Twin. The advantages of the Aspire can be quickly summarized: It is available for not much money and offers very long battery runtimes. Can you go wrong with purchasing it? 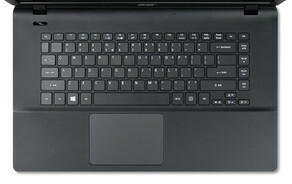 The Aspire ES1-511 uses the same design as its recently reviewed Packard Bell EasyNote TF71BM-C8R1 brother. Despite a low price of 250 Euros (~$313), the EasyNote performed passably and surprised us with a very long battery life. Our review will reveal whether the Aspire can keep up with it. All 15.6-inch notebooks with a price of about 300 Euros (~$375) are competitors of the Aspire. Apart from the EasyNote, these include the Asus X551MAV-SX391B, the Lenovo B50-30, the Lenovo IdeaPad G50-45, and the Acer Aspire E1-532, for example. We will not cover case, connectivity, input devices, display, and speakers in detail here since the Aspire and the EasyNote are identical. Information about these is available in our review of the EasyNote. As already mentioned above, the Aspire and the Packard Bell EasyNote TF71BM-C8R1 are identical. Just the keyboard printings are different. Another difference is the operating systems. While the EasyNote comes with Windows 8.1 with Bing (64-bit), the Aspire uses Linpus Linux. The Aspire also uses the same display as the Packard Bell EasyNote TF71BM-C8R1. They are quite dark but have decent contrasts. In addition, the viewing angles are narrow. The measurement values are slightly different, but this is usual. Two identical displays are never absolutely the same. 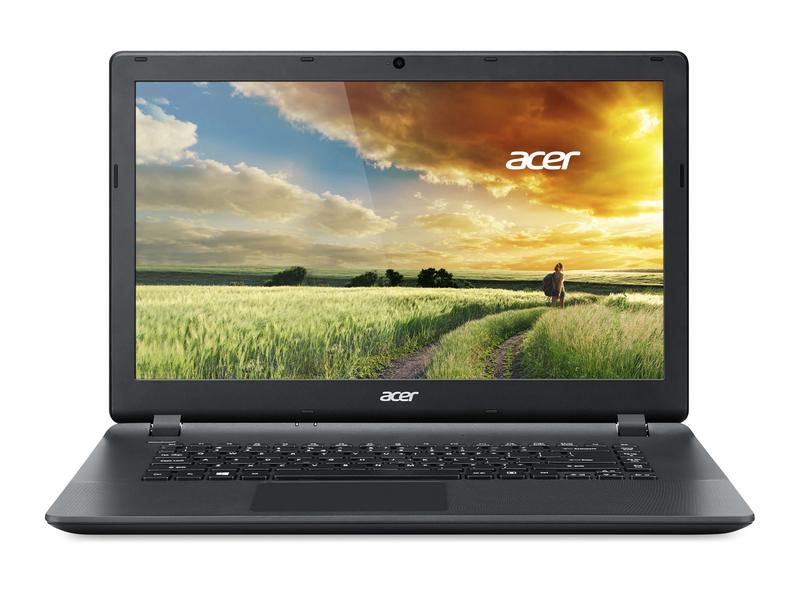 With the Aspire ES1-511-C50C, Acer offers a very cheap 15.6-inch office notebook. The computer is apt for office, Internet and video playback. Our test model costs about 280 Euros (~$350). Other models are available, too. Even though the numbers of the processors in the EasyNote TF71BM-C8R1 and the Aspire would only suggest small differences, they are actually bigger. While the EasyNote comes with a dual-core processor, the Aspire features a quad-core processor. As a result, the Aspire is twice as fast in multi-thread applications as the Packard Bell. The Celeron N2930 (Bay Trail) CPU works with a base clock of 1.83 GHz. Thanks to Turbo, the clock rate can be increased to 2.16 GHz. The TDP is 7.5 Watt. The CPU performance is nearly completely available: While the clock rate is 2.16 GHz in the multi-thread tests of the Cinebench benchmarks, the CPU clocks at 1.83 to 2.16 GHz in the single-thread tests. We installed Windows 8.1 64-bit in order to run our benchmarks. The system works smoothly and we did not face problems. Despite a quad-core processor, the Aspire hardly performs better than the identical Packard Bell EasyNote TF71BM-C8R1 with a dual-core processor in the PCMark tests. Reason: In these benchmarks primarily the single-thread performance is decisive and both computers are almost identical here. 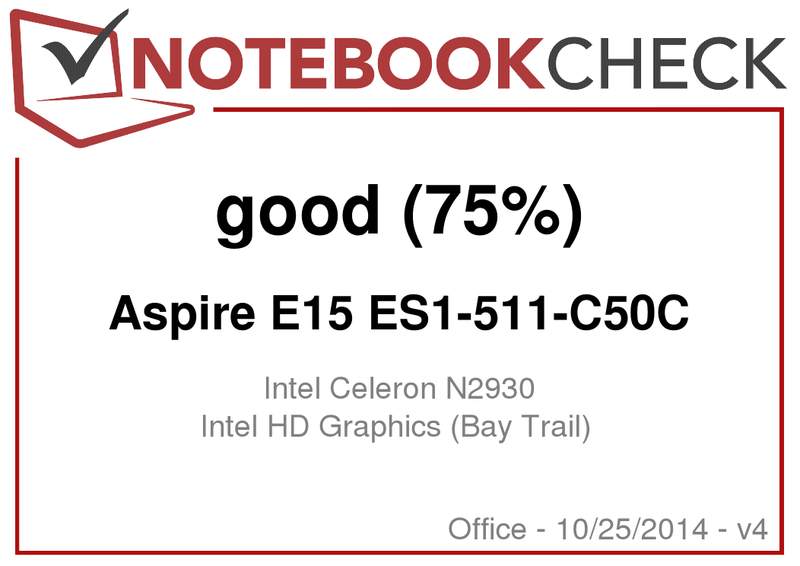 Computers like the Lenovo IdeaPad G50-45 (AMD A6-6310, Radeon R4 (Beema)) perform much better than the Aspire and the EasyNote. This is not primarily because of the faster CPU, but also because of the significantly faster graphics core. Acer equipped the Aspire with a hard drive from Western Digital with a capacity of 500 GB and a revolution speed of 5400 rpm. The transfer rates of the drive are good and meet the performance level of current 5400 rpm hard drives. The graphics core of the Aspire stems from Intel and is called HD Graphics. It supports DirectX 11 and works at a clock rate of up to 854 MHz. The results in the 3DMark benchmarks are as expected. But, they also show that this is a low-end graphics card. Comparable notebooks with AMD hardware, e.g. the Lenovo IdeaPad G50-45, deliver significantly more graphics performance. E.g. the Radeon R4 (Beema) core in the IdeaPad achieves more than three times the score of the Intel graphics core in the 3DMark 2011 benchmark. The IdeaPad costs about 20 Euros (~$25) more than the Aspire. The CPU and GPU of the Aspire were not made for running demanding 3D games. Only a very few games achieve smooth frame rates on the Aspire and these also require low resolution and low quality settings. Games from the Windows Store run without problems. 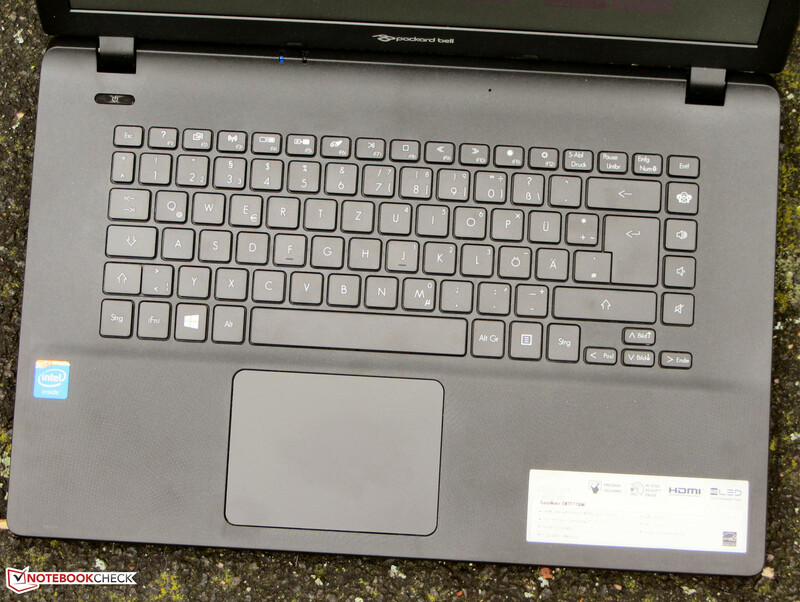 Regardless of the load, the Aspire is slightly louder than the Packard Bell EasyNote TF71BM-C8R1. This is not surprising since two more processor cores require cooling in the Aspire. Overall, neither notebook gets too loud. Whether on battery or in mains operation, the Aspire behaves the same way during our stress test (Prime95 and Furmark run for at least one hour): The processor starts at full speed (2.16 GHz). After about 20 to 30 minutes the clock rate falls to 1.83 GHz and remains there. The graphics core works at 820 MHz. Neither the Aspire nor the identical Packard Bell EasyNote TF71BM-C8R1 get particularly hot. During the stress test the case temperature remains below 40 °C in all measurement segments. The processor of the Aspire does not need particularly much energy. As a result the notebook is quite frugal. While idle the power consumption is, alike the EasyNote's, below 10 Watt. During the stress test it is only slightly higher than the EasyNote's. Two additional processor cores make the difference here. Our realistic WLAN test automatically loads websites in 40-second intervals. The energy-saving profile is active and the display brightness is set to about 150 cd/m². The Aspire achieves a battery life of 6:54 h and is on par with the identical EasyNote (7:09 h). This is not surprising since both computers feature the same batteries. 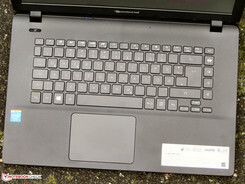 The verdict of the Aspire E 15 ES1-511-C50C is virtually identical to the identical Packard Bell EasyNote TF71BM-C8R1's: Both computers are available for not much money. They are apt for office, Internet, and video playback and they feature very good battery runtimes. In addition, they come with decent keyboards and matte, yet dark displays. At least, the contrasts are decent. The main difference between the two is their processors. 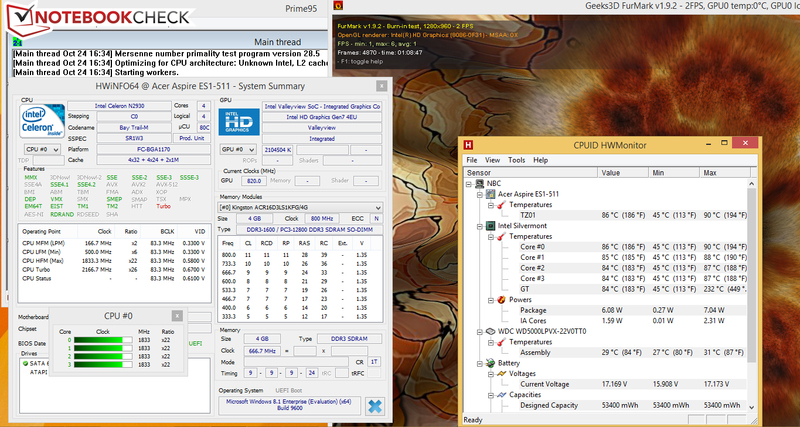 Users who require more multi-thread performance should select the Aspire, since it features a quad-core processor. The matte display and the long battery life. A brighter display and a maintenance hatch. Low price and 2 years warranty are not mutually exclusive. Packard Bell EasyNote TF71BM-C8R1, Lenovo B50-30, Asus X551MAV-SX391B, HP 15-g005ng, Acer Aspire E1-532, Lenovo IdeaPad G50-45.